Looking for a high-protein, dairy-free snack? Help your kids make this Middle Eastern recipe. 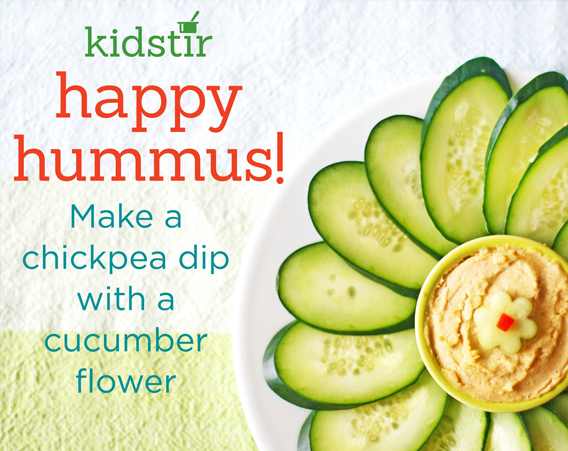 Explain that the chick peas in this dip are high in protein and keep us growing strong! 1. Rinse the chickpeas in a colander in the sink. 2. A grown-up should chop the garlic in the food processor. Then, add the chickpeas, salt, 2 tablespoons of lemon juice, 2 tablespoons water, and the tahini paste. 3. Press the buttons and process the hummus until smooth and creamy. Give it a taste test. If you’d like more lemon juice, water, or salt, add some and process again. 4. Cut the cucumbers into diagonal slices with the help of a grown-up. 5. Spoon the hummus into a small bowl. Set it in the center of a plate. Arrange cucumbers petals around it to make a flower.